Cocos nucifera is the botanical name of the coconut tree. This versatile plant has a variety of benefits that makes people from any part of the world impressed. Every parts of the coconut tree are used for a wide array of functions. It can produce different kinds of products that can be exported from the country like activated carbon, Ball copra, brooms, coconut shell charcoal, foods and delicacies like coconut jam, coconut chips and many more! Due to the significance of the tree, the Coconut Festival was originated to celebrate the phenomenal plant. 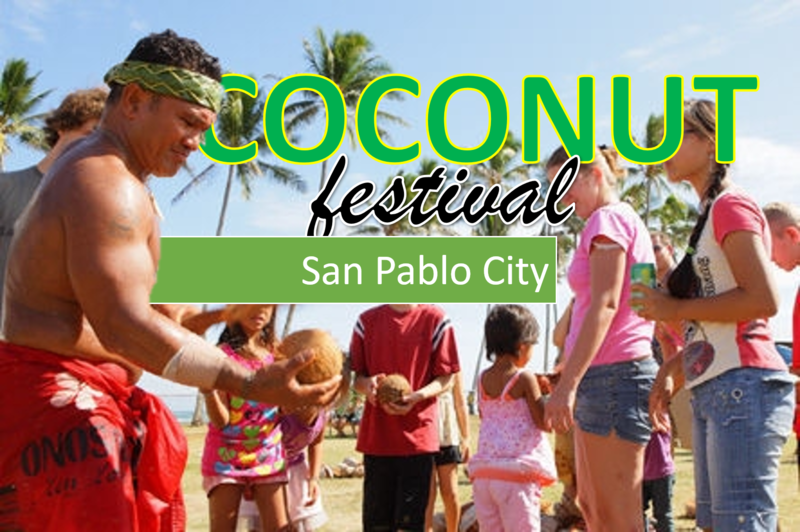 The event’s humble beginnings is in the year 1996, the Coconut Festival was officially started at San Pablo City, Laguna, Philippines and celebrated every second week of the month January. Coconut festival is an event to credits the abundance of the coconut tree in the Philippines, one of the trees that grow well in many parts of the country and in honor of their patron saint, Paul the Hermit. The long-week festival consists of various activities: street concerts, street dancing, float parade, nightly programs before the fiesta of the city and “Mutya at Lakan ng San Pablo”. Joining the celebration is much enjoyable because of its colorful surroundings. Tourists also can explore seven lakes of San Pablo. San Pablo has its biking destination in Laguna Province which makes it a haven for many cyclists. The festival serves as a thanksgiving for the city’s pride main crop: the coconut. San Pablo is well-known to its coconut trees abundance which has provided many livelihood opportunities to all residents of the city. The Coconut Festival is a multi-awarded event.It was cited as the best tourism event by the Department of Tourism for years 2010, 2011, 2012, and 2013. In 2013, the Coconut Festival is given the Pearl Award and as a Hall of Famer during the National Convention of the Department of Tourism – Association of Tourism Officers in Legazpi City, Albay. Tourists can enjoy the colorful float parade and street dancing competition. All of the competitors devote much resources and effort to bring home the major awards each year. These two main events have lured many photographers as well. The city government usually encourages local businesses to set up booths so they can promote their products.You can buy San Pablo-made products or delicacies in one place! No need to travel from one place to another if you want to bring home something from the festival. The best thing about the Coconut Festival is that it is just two hours away from Manila. You can spend a day or two in San Pablo City to experience this colorful and joyful festival this year.